1. Place half of the thigh fillets between 2 large sheets of clingfilm. Using a rolling pin or meat mallet, flatten to about 1cm thick. Repeat with the remaining fillets. 2. Mix the soya sauce with the ginger and garlic in a bowl big enough to take all the chicken. Add the chicken, cover and leave to marinate in the fridge for at least 2 hours, but preferably overnight. 3. Preheat the oven to 200°C, gas mark 6. Take 3 large shallow bowls or plates. Fill one with rice flour and season it with salt and white pepper, one with the beaten egg and the last one with panko crumbs. Remove a chicken fillet from the marinade, allowing any excess to drip off. Dip first in the seasoned flour to coat thoroughly, then the egg, followed by the panko, pressing the fillets into the crumbs so they are well coated. Repeat with the remaining chicken, placing them onto two greased large non-stick baking trays as you go. 4. Drizzle with the olive oil, then bake in the oven for 25-30 minutes, swapping the trays over for the last 10 minutes, until golden and crisp, and the chicken is thoroughly cooked, the juices run clear and there is no pink meat. Place on a wire rack to cool. Meanwhile, mix the mayonnaise with the gochujang paste and lime juice. 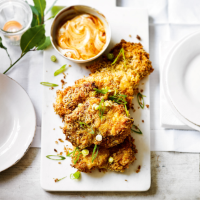 Serve the crispy chicken with the chilli mayonnaise.